Vancouver, BC, Canada is a city of one-half million residents, the largest in British Columbia and has one of the mildest climates in Canada. It is surrounded on three sides by water and sits nestled against the Coast Mountain Range. The views are stunning. Just a short ferry ride away, Vancouver Island is equally amazing but in its own unique way. Victoria, the largest city on Vancouver Island, is a must for anyone who loves beauty. If you are cruising to Alaska from Vancouver, definitely plan to start off by spending a few days here before you board the ship. In British Columbia, gay and lesbian couples can be legally married. Victoria hosts an Annual Gay Pride Parade and festival. The mayor and members of the City of Victoria council support and attend. Across the bay in Vancouver, Davie Village has myriad of gay-friendly bars, accommodations and nightlife. Commercial Drive is the hub of the city's lesbian community with a variety of affordable ethnic dining options, cozy bed & breakfasts and unique shopping opportunities. 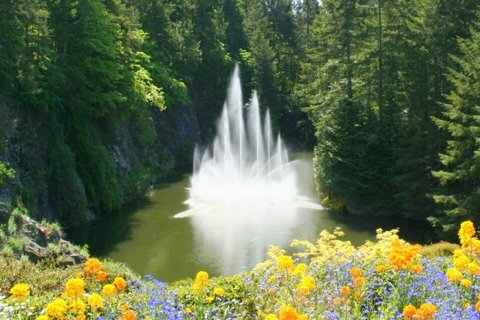 Butchart Gardens is a place that everyone talks about for good reason. It is stunning. Tucked into a 50 acre country estate, Butchart is a garden of beauty in every season. This is one of the most beautiful, most color filled places I have ever seen with fifty acres of spectacular views, winding paths, lush green lawns and amazing, intricate floral designs. It is hard to imagine that this estate was once a quarry where Portland cement was manufactured. Downtown Victoria is well worth a day trip. There are many things to see and do. One highlight is the Fairmont Empress Hotel – called the jewel of the Pacific. It is one of the most photographed attractions on Vancouver Island. Originally opened in 1908, it is a magnificent example of that time. Be sure to tour inside and outside. Within walking distance from the Fairmont Empress are the Parliament Buildings, surrounded by lush green lawns, statues, monuments and horse drawn carriages. It is a relaxing stroll from the Fairmont Empress, around the beautiful bay to the Parliament where the streets are filled with vendors and street performers. The harbor offers various boat tours that can be selected right at the piers. Some of the best totem poles and aboriginal art in Canada are on Vancouver Island. The Royal BC Museum is located in the harbor area of Victoria and adjacent Thunderbird Park have a large collection of totem poles. Chemainus is about one hour north of Victoria. Known as “The Little Town That Did,” Chemainus expressed its history, its people and its future by asking artists from around the globe to paint huge heritage murals on the sides of buildings, transforming a small coastal town into the world’s largest outdoor art gallery. A highlight of our visit was a eight hour working ferry trip from Port Alberni aboard the MV Frances Barkley - a 200 passenger and cargo vessel that serves the communities of Barkley Sound and the Broken Group Islands on the west coast of Vancouver Island. Ports of call included Bamfield, Uclulet, Kildonan and Sechart where we observed the loading and unloading of everything from food to mail at a floating post office. The scenic views were unreal with floating homes, wildlife, bears feeding on the shoreline and more. Cathedral Gardens is a natural wonder – a rare and endangered remnant of an ancient Douglas fir ecosystem. The biggest trees in the grove are about 800 years old, 250 feet high and 29 feet around! These giants make you feel as though you have stepped back into prehistoric times. The beaches around Vancouver Island are a hunting ground for natural driftwood. The fir, cedar, spruce and hemlock driftwood sculptured by nature and time is in great demand all over the world and is fantastic for photographers. Our Vancouver Island experience will never be forgotten and we recommend it to everyone. Watch our video of Vancouver Island below.